Think it looks unachievable? 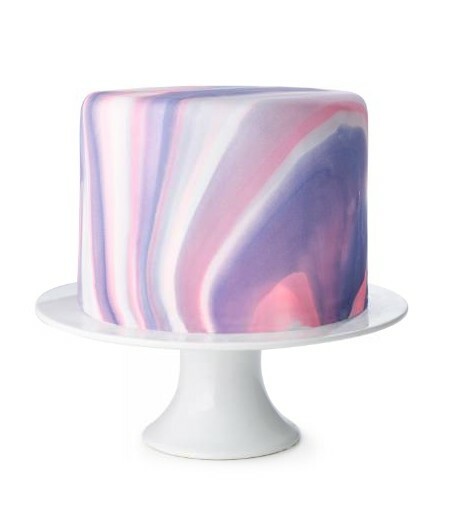 One of the biggest baking trends that’s emerging right now, marbling fondant icing is actually a really quick and easy way to give your home bakes an elegant, unique and impressive finish. All you need to do is divide your white fondant icing, add a little food colouring to each portion, twist, roll and stretch to work them together, then roll out and… ta-da! You’ve just made really impactful icing – no fancy techniques required. The more times you twist and roll the fondant, the more marbled it will be. We made ours with shades of white, pink and purple – wouldn’t it look fab with a few simple flowers on top? – but we can imagine it in white and blue for covering a seaside-inspired cake, or even in shades of grey for making marbled rocks for a garden-themed cake. And the best bit? It’ll look like you’ve gone to much more trouble than you actually have… we won’t tell if you don’t! Sound too simple? That’s because it really is super easy. Follow our three simple steps to achieve a professional marble fondant finish that will make your cake stand out for all the right reasons. Separate your icing then add a different food colouring to each ball. Combine the icing by twisting and stretching it to create one large ball. Roll the ball out into a circle to create the marbled effect.